Here, we introduce the Electric Bow System, a VR shooter game system. It uses real physical interactive content that changes a 360-degree all-around view in a room into a virtual game space. The bow interface was constructed on the basis of our previously developed technology; it has components of a real bow and devices that calculate obtained parameters in order to fit the real-world direction to the virtual world. Thus, our unique system easily achieves a virtual game space. This research is intended to establish a cognitive space where the force feedback, sense of immersion, and sense of existence are implemented in an interactive space reflecting the input of physical movements. 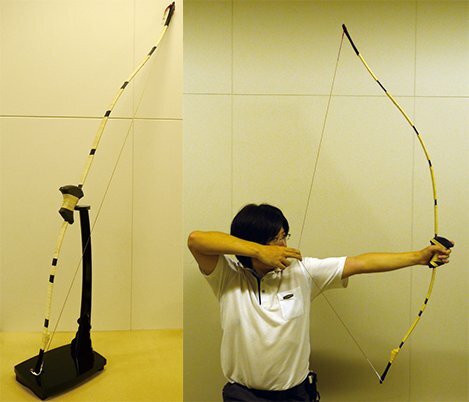 The Ni-Shiki system has been developed on the basis of Japanese archery to be applied to games such as first-person shooters (FPSs). Furthermore, contents are also developed using the Electronic Bow Interface. This research also attempts to actualize realistic force feedback and an interface where physical movement can be reflected. The San-Shiki-Kai system consists of two strain gauges, an optical sight, a laser projector, a 10-axis sensor, a battery, an Arduino Nano board and its control board, a Windows 10 PC, and a clicker. The 10-axis sensor is connected to the PC via a USB and is used to detect the direction of virtual arrows when they are shot. The degree that the bowstring is drawn is correctly calculated from the parameters of the strain gauges by a microcomputer (i.e., the Arduino Nano and its control board). 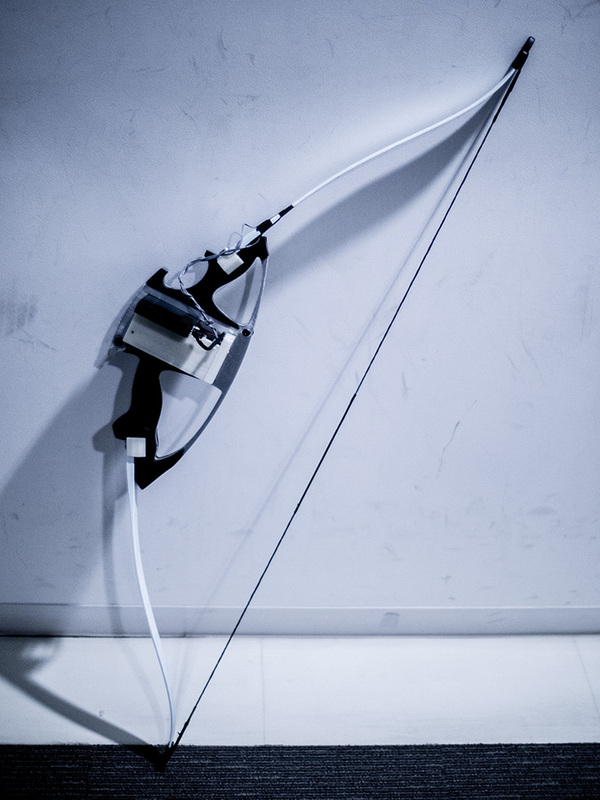 Therefore, the system can detect the strength of drawing the bow, the shooting distance of virtual arrows, and the shooting timing of virtual arrows with a high degree of realism. 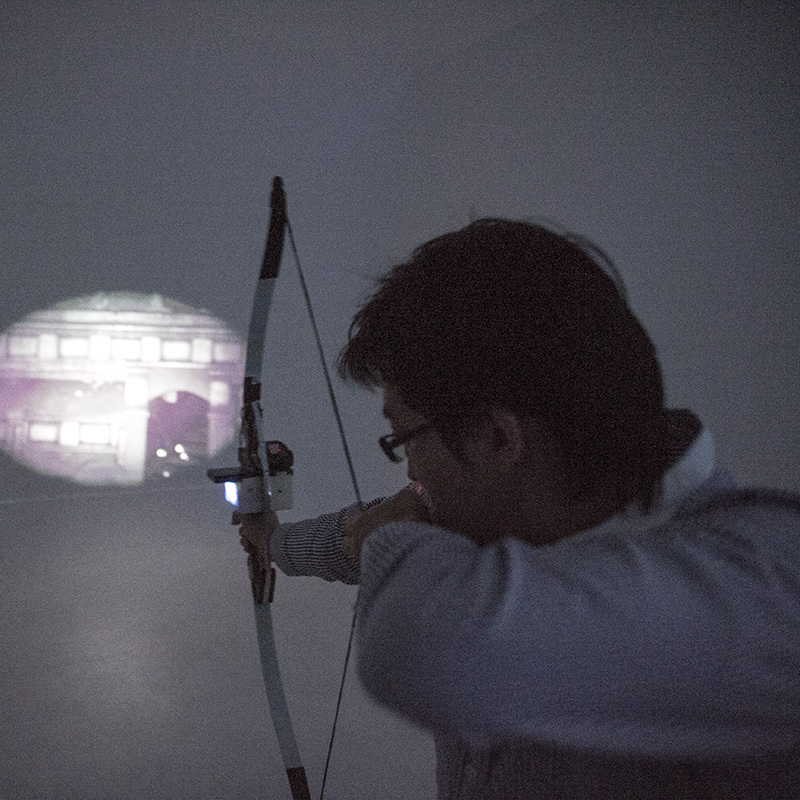 When the player holds the San-Shiki-Kai device, an image determined from the parameters of the 10-axis sensor and the playerʼs shoulder height and arm length is projected in the playerʼs shooting direction. If the player aims at targets in several directions, the system displays images corresponding to each direction. Therefore, the player can play the projected content on a roomʼs walls, floor, and ceiling as if the room were an all virtual space. 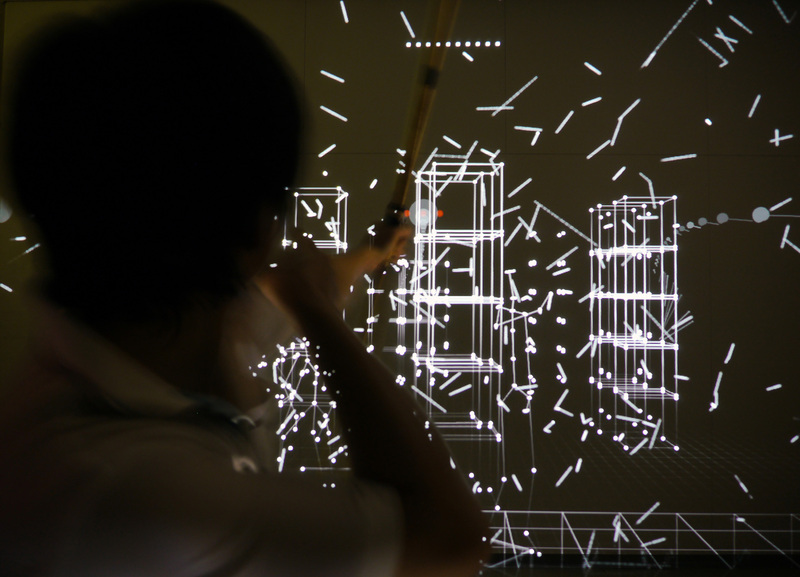 Consequently, by sensing various information obtained using such real instruments with a sensor and PC and projecting interactive images, San-Shiki-Kai can easily change a 360-degree all‒around view into a virtual space. 1. 安本匡佑. 2012. 日本Microsoft賞. Sense of Wonder Night 2012. Tokyo Game Show 2012. 東京 日本. 2. Masasuke Yasumoto. 2013. Prize of 3D Games & Entertainment. Laval Virtual Awards 2013. Laval France. 3. 安本匡佑　安藤公彦. 2013. インタラクティブセッション大賞. CEDEC 2013. 横浜　日本. 5. 安本匡佑　寺岡丈博. 2015. 最優秀賞. Mashup Awards 11. 東京 日本. 6. 安本匡佑　寺岡丈博. 2015. Abba Lab 賞. GUGEN 2015. 東京 日本. 7. 安本匡佑　寺岡丈博. 2015. グッドアイデア賞. GUGEN 2015. 東京　日本. 8. Masasuke Yasumoto, Takehiro Teraoka. 2017. Paper Awards. International Workshop on Advanced Image Technology 2017. Penang Malaysia. 1. Masasuke Yasumoto, Takehiro Teraoka. 2013. The Electronic Bow Interface Virtual, Augmented and Mixed Reality. Systems and Applications Lecture Notes in Computer Science Volume 8022, 2013, pp 436-442. 2. Masasuke Yasumoto. 2014. E-Yumi 3D -Bow Interface System for All Directions. 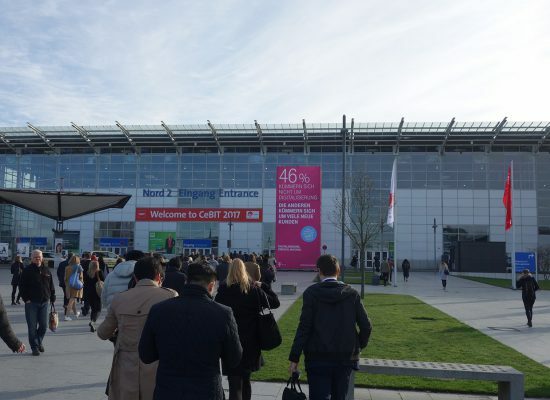 Nicograph International 2014. 6. Masasuke Yasumoto. 2015. Shadow Shooter: All-Around Game with e-Yumi 3D. Encyclopedia of Computer Graphics and Games/pp1-4/2016. 7. Masasuke Yasumoto, Takehiro Teraoka. 2016. SAN-SHIKI Electric Bow System : Applying Projection VR to “Game Sport” Replaying Japan 2016. Leipzig Germany. We will exhibit in TGS 2017 (Taipei Game Show 2017) at Indie Game Festa and Indie House, 19th – 24th in January. 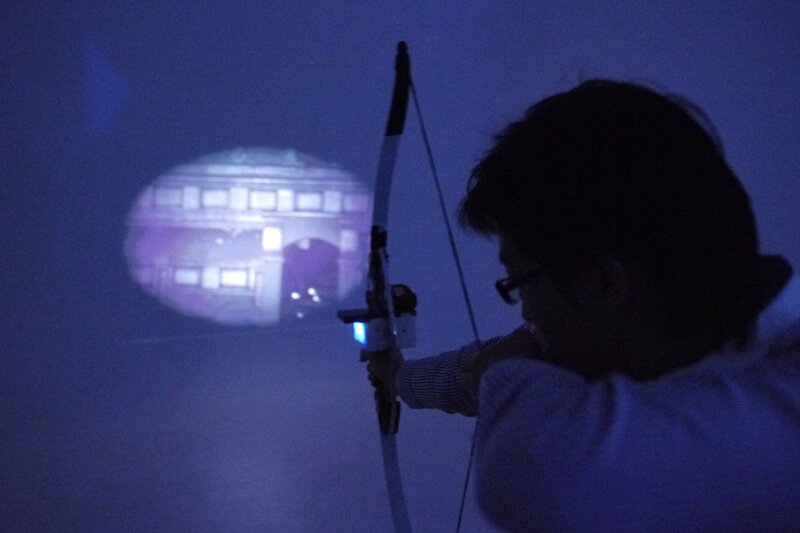 We will be exhibit “Shadow Shooter” that was the game using the Electric Bow System. And we will exhibit another contents that is VAIR. Please come to our booth (k02).